After developing concept designs for numerous campus sites, our team led the study to advance and further develop the Chapel design and imagery. Our team was honored to then be chosen to lead the design effort for the Chapel. 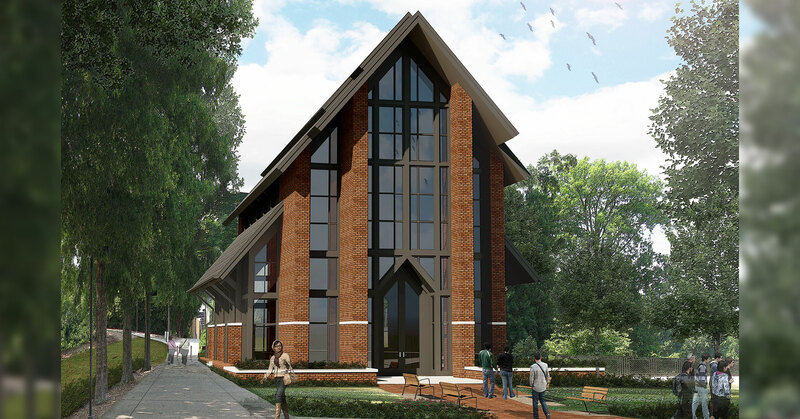 Now underway, the Chapel and gardens promote introspection through the creation of an inviting design character, and by taking full advantage of the picturesque landscape on the surrounding site located along the Campus Green. The character of the building is familiar and welcoming, with a strong vertical form and an open, airy interior with views to the surrounding landscape. Natural materials such as exposed brick, slate flooring, and wood structural members all work to achieve a highly crafted, detailed, and elegant design that enhances the surrounding campus. In addition to the large assembly space, the lower level of the Chapel includes an open gallery for gatherings as well as two private meditation rooms. The lower level opens to an outdoor gathering plaza and a garden path with small nooks of seating that create places for visitors to pause to meditate, reflect, and enjoy the surrounding natural scenery.